If you're looking for value accommodation among the wide selection of Bohol resorts in Panglao, then you should check out Dumaluan Beach Resort. It's actually beside Bohol Beach Club, the more popular among island resorts in Panglao, yet Dumaluan offers rooms at more affordable rates. Dumaluan Beach resort is located at a more serene side of Panglao. The view from this Bohol resort is picture-perfect. Any tourist would love basking in the fine white sand, enjoying the sight of the sky merging with the sea with huge white clouds looming over the horizon. Unlike Boracay, people here are lesser in number. One could easily read a good book and relax under the shade of nearby trees. Accommodation & AmenitiesRoom rates start at Php1300 for a Standard Aircon Room, Php2150 for a Deluxe Room, and the suites start at Php2500. 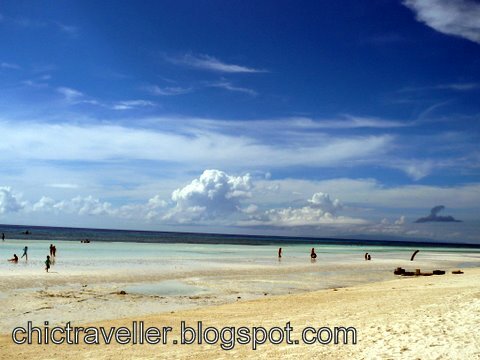 At the time we got a reservation, most of the resorts in Panglao were fully booked. 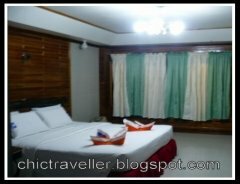 In Dumaluan, we were able to get a family room for Php3500. The family room did not offer much, except a LOT of space and a heater in the shower. The room and the bathroom were very spacious, and the bed was probably bigger than normal. What I liked is that I get to have breakfast by the sea, even if the breakfast selection is not too amazing. They simply offered us a choice of longganisa or hotdog with egg, and beverage choices of coffee, tea or juice. I also liked their big pool. The water went as deep as 8ft, and there's a small kiddie pool on the side. If you're like me who gets to catch up on her exercise only when swimming, then you'd really enjoy this pool. I got to do a few laps in the morning sun, and there weren't a lot of people yet. Pool is open until 10pm, and the rooms are just nearby so it's a short walk to a quick shower after a dip. I'm not too enthralled with the food that the resort offers. What I liked though is that there's a small dining place nearby wherein you could have the freshest catch cooked for you. Choose from a variety of fishes like lapu-lapu, blue marlin, and bangus and they will cook it to your liking. They have meat selections too. Prices are cheap. I ordered grilled blue marlin (Php120) with rice and mais con yelo (Php45) and I got it for less than Php200! 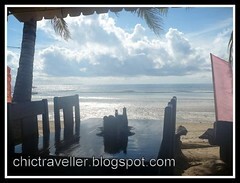 You get to dine in nearby cottages, and enjoy the view of the sea. 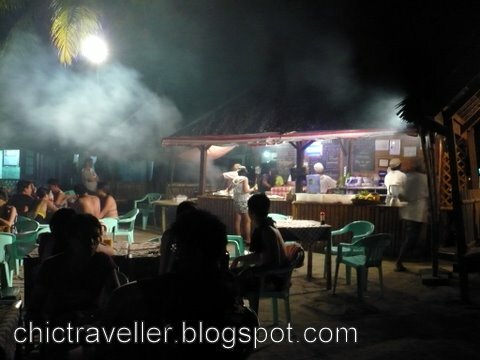 This is definitely a unique Panglao island experience. The staff at Dumaluan Beach Resort in Panglao are helpful, but they're not cheerful nor polite. They did accommodate our requests like taxi and dolphin watching, but it seemed like they weren't happy doing so. It would be a big plus if their staff learned to smile once in a while. Hire a taxi from Tagbilaran City in Bohol to get to Dumaluan Beach Resort in Panglao. The usual rate to Panglao is double the meter rate, which is approximately Php350. You are free to haggle with the driver on the best rate. It's more economical to travel in a group so you could spread the cost among you. Travel time from Tagbilaran to Panglao is about 30 minutes. For a full list of room rates, click here.Like this post? Subscribe to The Chic Traveller! I don't mind khit kegler or ar-wee-der-yet or even carlo. My blogger friends call me either 1 of those. Hi, Mitz! Thanks for the info. Actually, I heard about Dumaluan Beach. I didn't know they have a swimming pool though. Do you know if they a playground too so my son can play? I'll check out their website later. Btw, from Tagbilaran to Panglao, we only need to take a taxi? No boat ride whatsoever to get to the island? @honney: hi honey. they have a big yard near the restaurant pero basketball court lang ata yun. Hi! 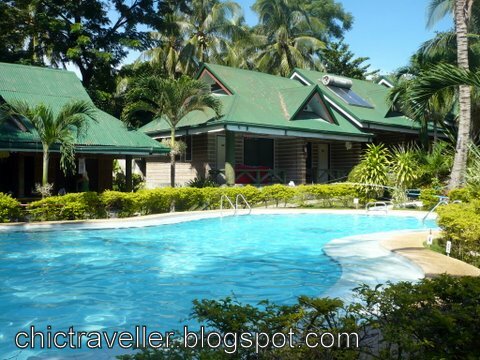 Does Dumaluan Resort offer Bohol Tours and do they have a rent a car? By any chance, do you have a contact person or someone you can recommend for the Bohol tour packages? @jepayd: yup they do have tour packages :) you could have it arranged at the front desk and they'll take care of everything for you. please see the number of dumaluan in this post :) thanks for dropping by! hi manny. 3days 2 nights on twin sharing standard accommodation in dumaluan will cost about Php4000+. More info can be found here http://www.dumaluanbeach.com/specials.php. For plane fares, it pretty much depends on how early you book and which promos you get. Be on the lookout for great deals. hi! we're going to bohol on april but we can't decide to which resort should we book since our choice (BBC) is already fully booked. Dumaluan is our next choice but there are various bad reviews regarding their rooms. Are they clean, especially the toilet and bath? Help us please we need to decide right away. Thanks in advance!